The Hebrew University of Jerusalem, a globally recognized leader in education and innovation, signed an agreement Wednesday to partner in a new research institute led by the University of Illinois System that will foster broad-based collaboration to solve the world’s greatest challenges. The Hebrew University, which produces a third of Israel’s civilian research, will bring unique expertise to the Discovery Partners Institute (DPI) in three vital areas – entrepreneurship, food and agriculture, and computing, including big data, artificial intelligence, and cybersecurity. DPI, a purpose-driven, collaborative research center led by the U of I System in downtown Chicago, will be home to thousands of students and more than 100 top researchers. They will work with academic, business and tech partners around the world on breakthrough discovery to drive economic growth and prosperity in Chicago, the state of Illinois and beyond. The Hebrew University, which has eight Nobel laureates among its faculty and alumni, joins prestigious academic partners at DPI that also include Northwestern University, the University of Chicago, Tel Aviv University, and Ramaiah Medical College in India. Hebrew University President, Professor Asher Cohen said the collaborations will lead to new discoveries, startup ventures and products that will advance global economic growth. 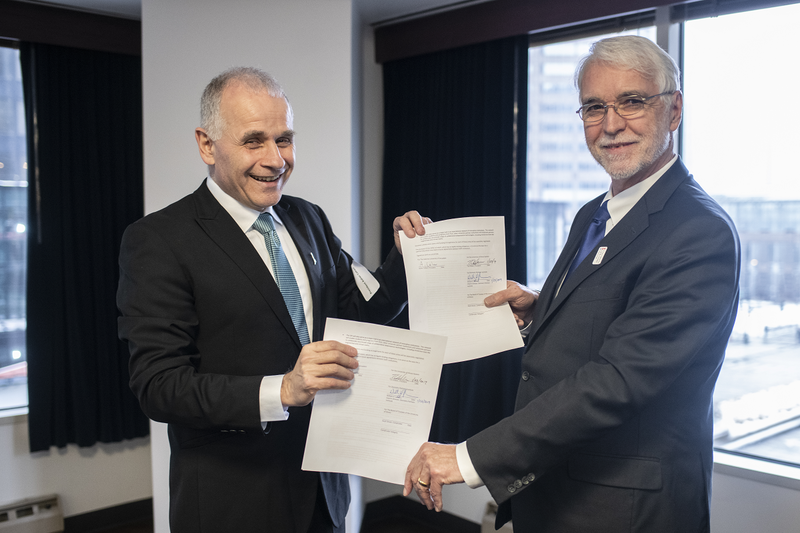 Under the agreement signed Wednesday by officials from both universities, research and instructional space will be created within DPI for Hebrew University faculty and students, as well as for joint research and educational programs. Faculty and students also will collaborate from the university’s six campuses in Israel via a broad range of state-of-the-art telepresence technologies. The Hebrew University is Israel’s top-ranked academic and research institution, and among the top 100 worldwide. Serving more than 23,000 students from 80 countries, it ranks 12th worldwide in biotechnology patent filings and commercial development. Yissum, the technology transfer company for the Hebrew University, has registered more than 10,000 patents covering nearly 3,000 inventions and will play an important role in DPI’s efforts to spin innovation into businesses and jobs. The transfer company’s achievements include a medication effective in treating mild and moderate Alzheimer’s disease, and technology that gives motorists warnings for collision prevention. The university also is actively establishing international strategic partnerships throughout the United States and other countries. More international centers of cooperation will be announced in the near future. DPI currently operates in offices at 200 S. Wacker Drive in Chicago. A permanent facility will be developed on a donated site along the Chicago River, bringing together top faculty in agriculture, healthcare, computing and data, the environment and other critical fields. The institute also will be the centerpiece of the Illinois Innovation Network (IIN), a virtually connected statewide enterprise of university and business partners that will use education and research initiatives to launch new companies, strengthen the workforce and lift communities. Last spring, the Illinois General Assembly approved $500 million in state capital funding to launch DPI and IIN.